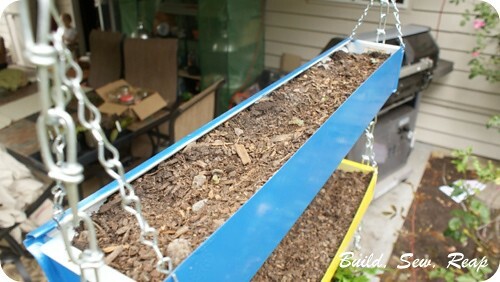 I got so sick of things munching on my salad greens that I finally suspended them from the ceiling on our back patio. To build the hanging garden, I used one piece of gutter cut to three 24-inch pieces, 3 right and 3 left gutter end caps, some left over spray paint, and some chain. I cut the gutters to size, attached the end caps then painted the outside of each section. I then drilled small holes in the bottom of each gutter and laid a scrap piece of screening down the center. This ensured proper drainage while keeping the soil from just running out the bottom. The real tricky stuff came when I tried multiple times to kill all my plants by forgetting to water them. When you only have a few inches of soil and metal containers to hold your plants, they dry out really fast. I decided to add some drip irrigation to slowly water the plants and to allow me to watch the water level so I'd know when it was time to refill. 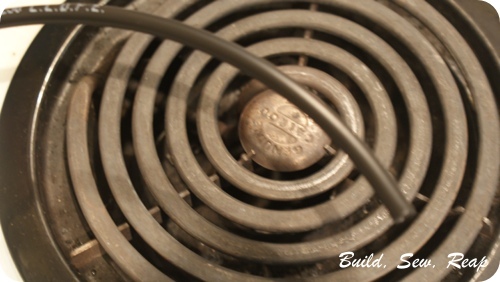 Cut a length of tubing to 24 inches for each tray then heat it over the stove to relax the curve out of it. Do not touch the tubing to the stove, just hold it above so it gets warm. Then manipulate it with your hand or an oven mitt. The kind of tubing I bought was sold in a coil so it needed to be gently warmed to relax the curve out of it. 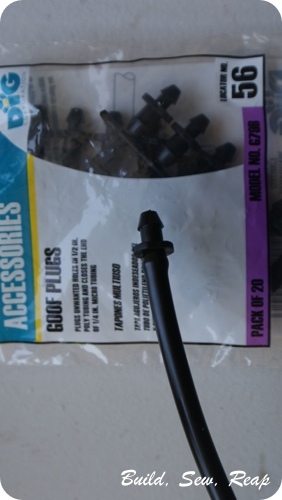 Once it is straightened out, warm one end and shov in a goof plug. 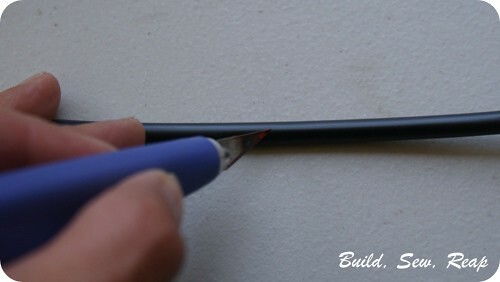 Next, use an exacto knife to poke very small holes a couple of inches apart for the length of the tube. I first tried drilling holes using my smallest drill bit but they were still too big and the water just poured out instead of dripping. Repeat the above steps for each of your gutter trays then set the tubes aside. Next, you'll prepare the caps to the 1 liter soda bottles. Drill a small hole in the top, too small to hold the 1/4 inch, 90 degree turn pieces. Warm the hole with a lighter and shove the piece through. 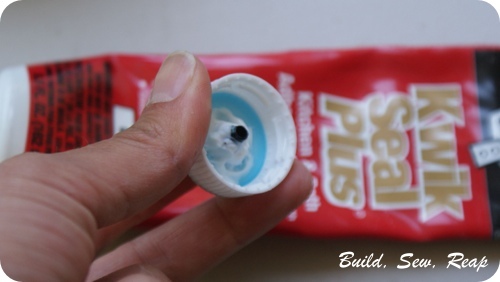 Since this still doesn't create a water-tight seal, dab some Kwik Seal Plus caulking in around the inside of the cap and set the cap aside to dry over night. To get the bottles ready, cut the bottom off just at the ridge. 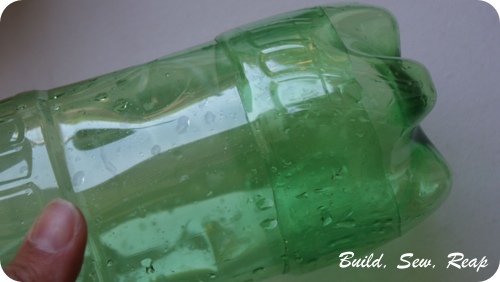 This allows you to easily fill the soda bottles with water and if you need to, you can also use the bottoms as lids because they'll slide right over the bottles. You'll have to wait awhile for the caulking to dry. I stepped away from the project for a couple of days although I think it only took 1 to dry fully. When it is dry, you are ready to attach the tubing to the 90 degree joiner. Warm up the end of the tubing with a lighter or your stove top (be careful, I'm not to be held responsible if you set things on fire) then shove it on the piece sticking out of the top of the soda bottle top. Make sure the holes you cut with the exacto knife are facing away from the cap. 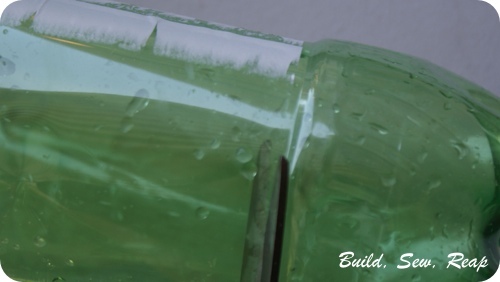 Now put the cap on the soda bottle, invert, set the tubing in place, secure the bottle to your gutter (I used zip ties) and fill it up (oops, I forgot to slide the bottoms of the bottles back on). You should see the water dripping through the tube at a nice slow rate. If you need it to be faster, just poke it more with the knife. How do you keep your garden watered? Do you have a secret to remembering? I can handle the big garden but the gutter garden seems to dry out daily without the drip system so it's trouble for me. 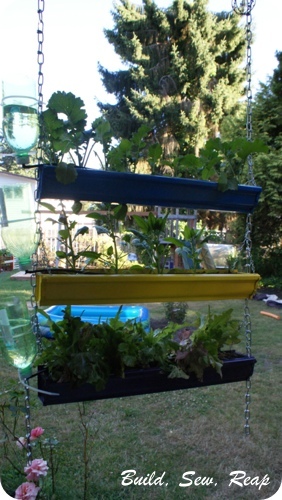 What a great idea to hang your garden! It looks beautiful! 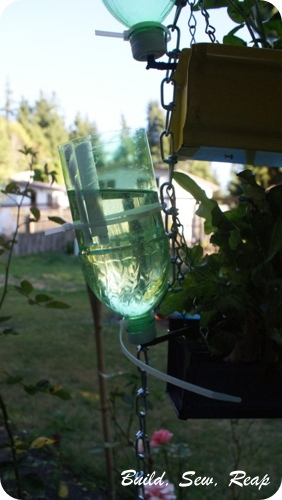 Love your drip system-- I can't believe you can rig something up like that!